This coconut based beetroot gravy / kurma is a perfect accompaniment for chappathi, poori or any Indian bread varieties; also a tasty way of including this health rich vegetable in our diet! Wash and scrape the skin of beetroot and potato; cut into bite size cubes. Keep aside. Pressure cook beetroot and potato for one whistle adding very little water. Keep aside. Grind coconut, roasted channa dhal and fennel seeds using water; keep aside. Heat oil in a kadai; season it with bay leaf, cinnamon, cloves and cardamom. After it crackles, add finely chopped onion and fry till colour changes. Saute till the colour changes after that add ginger garlic paste, tomatoes, red chilli powder and salt. Fry till tomato melts. Add little water, if it sticks to the pan. Then add coconut paste and cooked vegetable along with a cup of water. Mix well. Close the pan with a lid and allow it to boil till the gravy thickens. Let it simmer for 10 minutes or till the oil comes out. You can also prepare this dish using only beetroot and without potato. 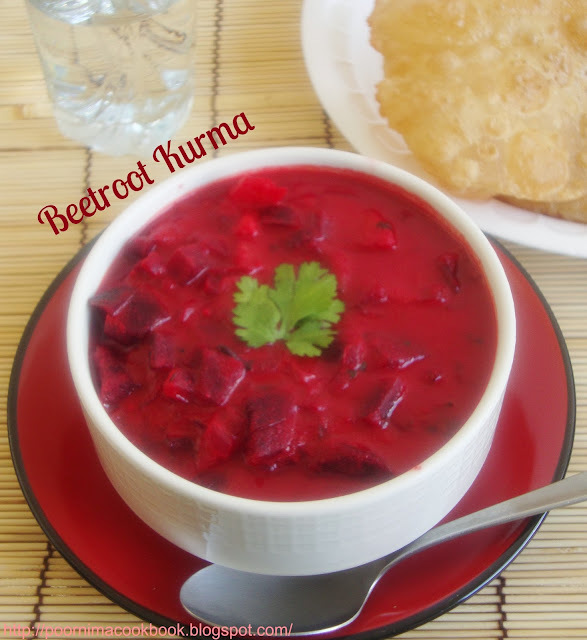 color looks so vibrant..I've some beetroot in my refrigerator...will try this and let you know..
Yummy and healthy kurma ! Thank you friends; it's your encouraging feedback that keeps me going. so colourful! !sure it is delicious! 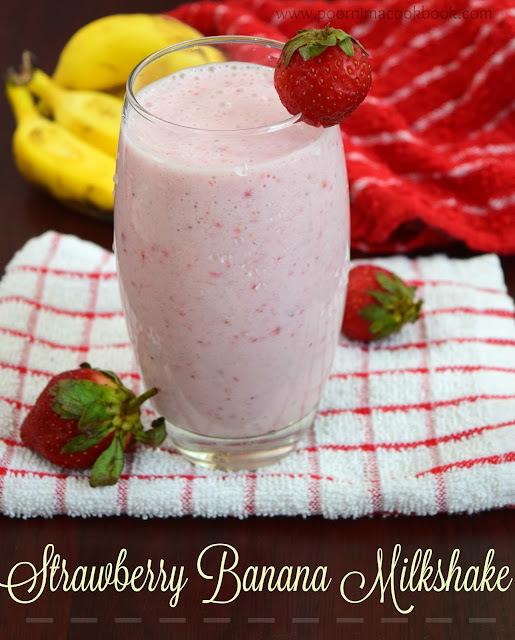 will it give sweet taste?. looks colourful..
Natural sweetness will be there; but not dominating. You can also increase the amount of red chilli powder. Yummy taste.New to me .Thanks for remainding. Thank you priya for trying my recipes and glad that your kids liked it. Special thanks for your prompt feedback. Tried this recipe with poori and chappatti. It's very delicious and smells authentic!! Thanks to Poornima's cook book. 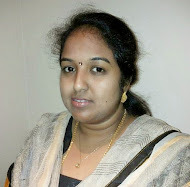 Thank you deepa, for visiting my blog and trying out the recipe. 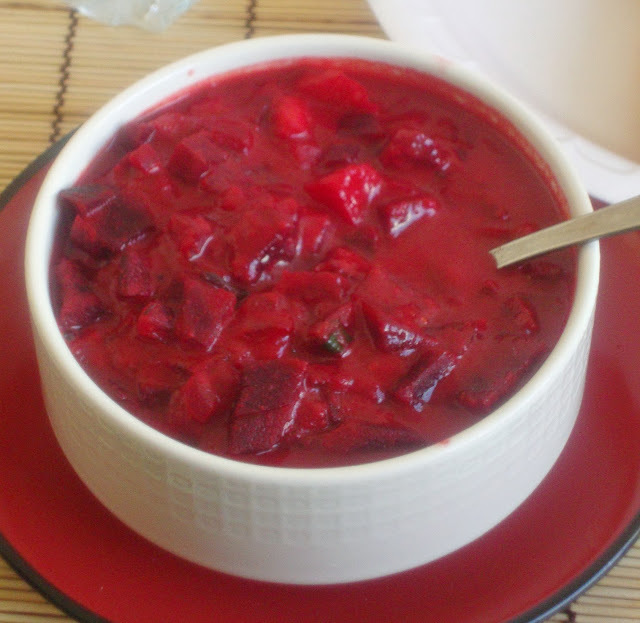 Really happy to know that you enjoyed the beetroot kurma recipe.